The G90 has a body-length character line leading from the front to the rear lamp cluster. The South Korean automaker announced plans for a new Genesis luxury brand just last week and conveyed the design for its first model Nov. 10 in Seoul. The G90 will be the new brand’s range-topping model and a successor to the Hyundai Equus, which will be phased out. 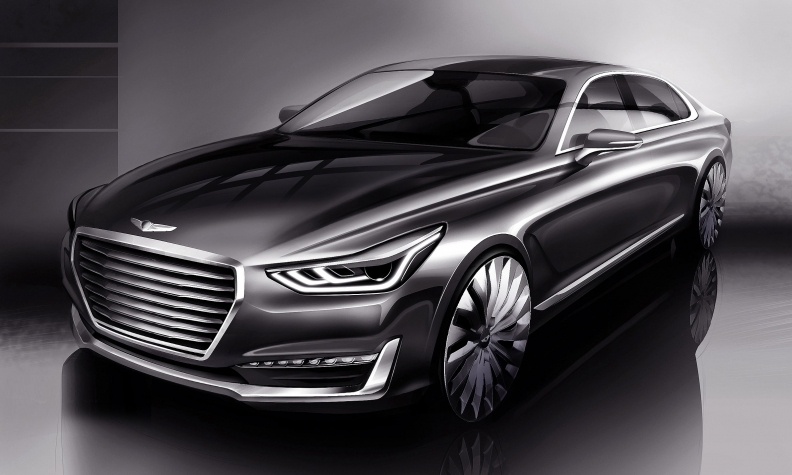 Hyundai described the G90 as “elegantly designed” and “technology packed.” It will form the basis for the brand’s design indent as it launches five more nameplates through 2020. The rendering depicts a low-slung sedan with a long, dignified hood, narrow greenhouse and sloping, fastback silhouette. The large grille is crowned by Genesis’ spread-wing emblem and flanked by what Hyundai called “sophisticated” headlamps that aim to communicate a futuristic aura. A clean-cut character line creases the entire side culminating in wraparound taillights. Hyundai hinted at the looks in August, when it unveiled the Vision G luxury concept at the Pebble Beach Concours d’Elegance. Hyundai says the G90 has a dynamic, future-orientated character with the Genesis emblem above the large grille and "sophisticated headlights." “The G90 sits at the pinnacle of the Genesis brand and demonstrates how we apply our human-centered values to give our customer true satisfaction in every aspect of the vehicle ownership experience,” said Yang Woong-Chul, head of Hyundai Motor R&D Center and vice chairman of Hyundai Motor Co. It goes on sale in South Korea early next month as the EQ900. 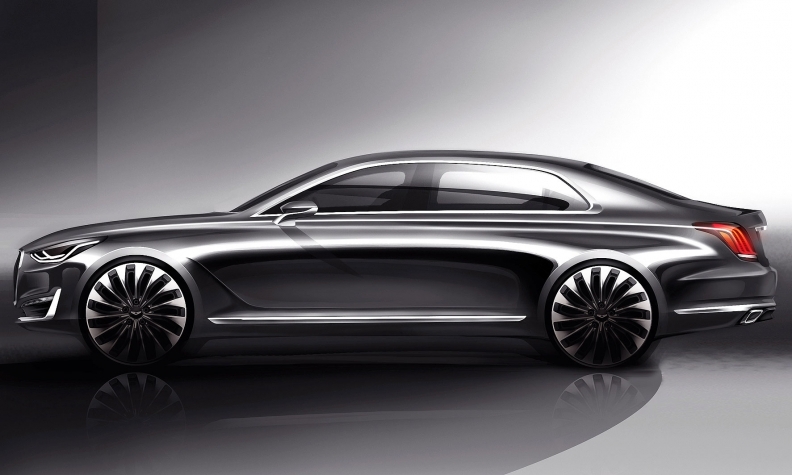 Genesis’ lineup will span three sedans. The top two rungs will be the G90, standing in for the Hyundai Equus, and the G80, in place of the Hyundai Genesis. Also in the works: a smaller G70 sedan, a coupe and a midsize crossover and larger SUV. Hyundai has long dreamed of building a luxury brand to tap new segments and bolster profit margins. The move also could burnish the image of the Hyundai brand and catch a tailwind from booming luxury-car sales. Hyundai aims to initially sell the Genesis brand in Korea, North America, China and the Middle East.